A whole new class of businesses has discovered the subscription business model. Many internet-based startups realize that monthly memberships suit them better than selling one-time up-front payment for products and services. The business model for fitness has long been club subscription memberships along with add-on features and in gym purchases. Changes in technologies and consumer preferences have helped to make automated payments over time more appealing. The psychology of subscriptions changes the way customers think about your business. The pain of massive up-front payments that scare off prospects, without consideration for the big picture. A monthly sum is much more affordable, reducing the pain threshold to make the purchase. However, this also makes members more sensitive to small changes once they’re used to a particular format. 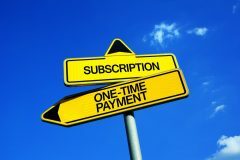 Subscription economics are exciting for many businesses now. We’ve known the secret in the fitness business for many years. You can sign up people for a recurring payment if you have the tools to handle recurring payments efficiently. Within our industry, gym management sales solutions like the system we developed at Gym Insight make running a gym easier. The same payment and client management technology open opportunities for diverse companies. Modern software payment systems automate your income. There is no need to chase after payments or charge regular bills at the front desk. The subscription model is so much less labor-dependent than it would have been even a decade ago. As the capabilities and design of subscription systems have advanced, they’ve become a real option that makes business more efficient. For Blue Apron (APRN), assumptions about subscriptions led to a major hiccup when they decided to join the stock market. The company sells semi-prepared food boxes that are to dining what IKEA is to furniture, and they do it by monthly subscription. Their initial stock offer started out well, but the decision by management to pull back on marketing resulted in a dangerous drop in new customers. A recent Harvard Business Review article investigated and found that the company had been running on a high-speed treadmill of signing serving and losing customers; retention was very low, cutting back on marketing hit revenue hard and fast. The philosophy of Blue Apron executives had been to drive growth, grab the new members and figure out the rest later. Later came and it wasn’t pretty. The drop in value for Blue Apron is a near-perfect example of how sensitive subscription-based businesses are to changes in retention. Blue Apron is still struggling to turn around, and it looks like they learned a lesson at a high price; neglecting retention is the most significant hazard to avoid when you depend on subscriptions. To measure the value of members who pay monthly, you have to consider lifetime customer value which means estimating how long your customers will stay with you. Blue Apron made the mistake of assuming that customers would stay much longer in theory than they do in practice. Imagine changing your billing and subscription program in a way that shifts payments to the members who’re least able to pay. Changing the subscription format is precisely what the artist sponsorship platform Patreon tried recently with an embarrassing outcome for the founder. Digital subscription models like Patreon are exceptionally transparent, so all of the members knew changed which party was responsible for fees and members perceived it as unfair. The change upset customers and led to an embarrassed retraction so that the company had to back away from the new fee structure. Fortunately, fitness subscriptions are less challenging than other markets like meal boxes and artist patronage platforms. However, these stories make the point that retention and service are critical to succeeding in any type of monthly business model. You have to make changes fair and transparent, and for your own sake, you have to maximize retention. In any case, your small gym business risks losing customers faster than you can find new clients to replace them. So, understand that a monthly subscription business model is a blessing, but be careful to make it work for both your membership and you. Conte, Jack. We messed up. We’re sorry, and we’re not rolling out the fees change. December 13, 2017. https://blog.patreon.com/not-rolling-out-fees-change/ (accessed December 29, 2017). Fagan, Lawrence. Client Retention Habits To Get Your Fitness Club Through The Slow Times. https://blog.gyminsight.com/4776-client-retention-habits-to-get-your-fitness-club-through-the-slow-times/. McCarthy, Daniel, and Peter Fader. Subscription Businesses Are Booming. Here’s How to Value Them. December 19, 2017. https://hbr.org/2017/12/subscription-businesses-are-booming-heres-how-to-value-them (accessed December 29, 2017). Ohlheiser, Abby. Facing a rebellion of furious creators, Patreon backs away from a new fee. December 13, 2017. https://www.washingtonpost.com/news/the-intersect/wp/2017/12/13/facing-a-rebellion-of-furious-creators-patreon-backs-away-from-a-new-fee/?utm_term=.b4f9990d69de (accessed December 29, 2017).